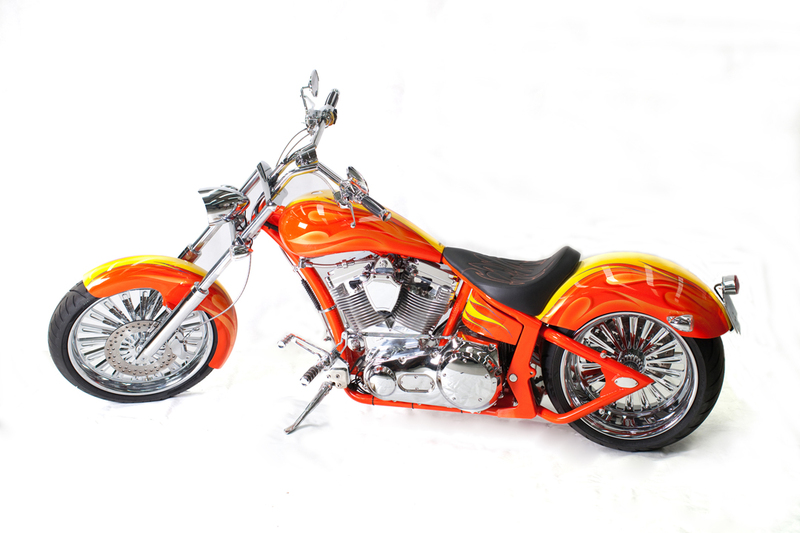 Each paint is a hand signed custom one-off dream by Buck @ BUCKWILD PAINT, famous for his work on Pimp My Ride. Made in the USA and fully ADR compliant, this one-off customised PRO-ONE ROGUE boasts the usual list of top quality accessories below. TP 45 degree V-Twin 121ci four stroke engine, fully polished with chrome accessories; 45mm MIKUNI carb; Chrome Exhaust with heat shields; BAKER 6 speed fully polished RHS drive transmission; Custom multi colour candy and pearl paint with matching powder coated frame; TIGHT 18 Billet wheels with matching rotors and pulley; Massive 300mm rear tyre; Exclusive PRO-ONE strutless rear fender; 3o raked chrome triple trees, 38o frame rake, 4” backbone stretch; Dual adjustable rear shock suspension; 4 piston PRO-ONE billet aluminium brake callipers; Custom tank with flush mount cap; Custom PRO-ONE Stinger handlebars with all-in-one digital readout console; Braided s/s brake and oil lines.